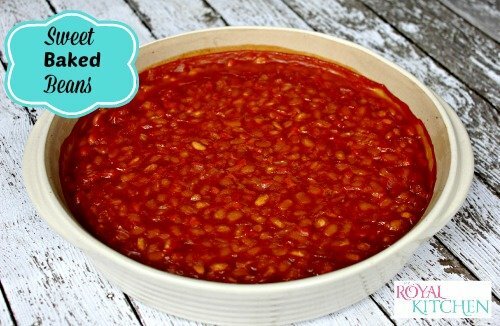 This Sweet Baked Beans Recipe is a southern tradition in my household. My mom has been making this simple recipe since I was a little girl and now I am making it for my family. Of course the way my mom made it was a dash of this and a dash of that, she of course never measured anything. I finally got her to sit down and figure out the measurements so that I could share it with you. Now I am teaching my kids how to make it. This recipe is perfect for BBQ’s, church function, 4th of July, Memorial Day and Football parties just to name a few. The only thing I change for my family is I leave out the onion as my family isn’t crazy about onions. However they will eat them in certain dishes. I made these on the stove on this particular occasion but you could also make a double bath in your favorite crockpot as well for a bigger crowd.Don’t forget to add this recipe to your free Recipe box and pin it on Pinterest. Follow us on Pinterest. With most people you are either a sweet baked beans person or a tangy baked beans person. So we want to hear, which one are you? This Sweet Baked Beans Recipe would go great with our Easy 123 Roasted Potatoes and Crockpot BBQ Pulled Pork Recipe. Drain 1 out of the 3 cans of pork and beans.